Dr. S. Manivasakan had obtained his M.A., from the Department of Defence Studies, M. Phil., from the Department of Geography and Ph.D. in the Defence and Strategic Studies. University of Madras. Since 2000, he has been working as a Teaching Feculty in the Centre for South and Southeast Asian Studies. University of Madras. Prior to his appointment in the Centre, he worked as a Guest Faculty in the Department of Defence and Strategic Studies, University of Madras. He has organized several Seminars/ Conferences at National and International level including the International Conference on ‘Terrorism’ (2002). The papers presented in the conference ignited interest and based on the discussion, proceedings of the conference was brought out as an Edited Book on ‘Terrorism’ (2003). Dr. S. Manivasakan has been researching on Sri Lankan ethnic problems and impact on India. He has published two books on the ‘Strategic Dimensions of Sri Lankan Ethnic Conflict’ (2000). He has published research papers as a monograph titled on “Peace Efforts in Sri Lanka” He has visited several Universities in Southeast Asia and gained rich experience in South and Asian Studies. The twentieth century witnessed many Guerrilla uprisings in various parts of the world, especially in the Third World countries. Various revolutions such as People's War in China under the leadership of Mao Tse-tung, Vietnam people's struggle led by Ho Chi-Minh, Revolutionary War In Cuba led by Ernesto Che Guevara were launched as Guerrilla Warfare. Thus, the Guerrilla Warfare has made great impact on the political arena of the modern world. The Guerrilla Warfare has its own Ideology, Strategy and Tactics. Eminent Scholars on these aspects have undertaken many studies. These studies have made attempt to develop some coherent theories of Guerrilla Warfare. In a war or struggle against a powerful army, the fighters have to first defend themselves from the onslaught of the enemy army, with the support of the local people. This forces them to form themselves in small squads, use traditional or locally available weapons in their fight and follow hit and run methods in their fight. Their initial attempt is just to weaken the strength of the enemy. Slowly they establish Guerilla Zones, then Guerrilla Bases. Only after this stage of development, the fighters prefer to have direct fight - Positional Warfare - with the Standing Army of the counterpart. 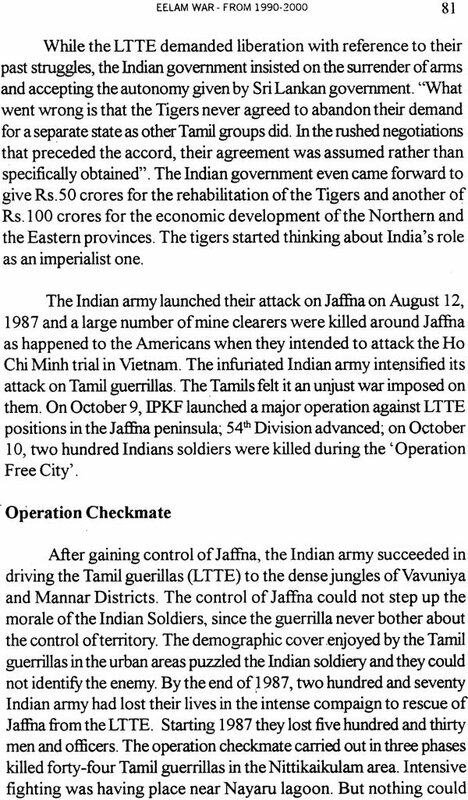 Dr. S. Manivasakan, a faculty from the Centre of South and Southeast Asian Studies of our University, has made a detailed study about the Guerrilla Warfare in general and about the Ealam War In particular. He has analysed vividly the ethnic conflict in Sri Lanka. The struggles of the various groups involved in this conflict have been studied meticulously. Since Sri Lanka is a nelghbour, the Government of India could not be a silent spectator to this ethnic conflict. It has taken a balanced stand with regard both to the Sri Lanka Government and to the various fighting groups. Dr. S. Manivasakan has made a sincere effort to present a clear picture about this. I appreciate and congratulate the academic efforts of the young scholar Dr. S. Manivasakan for having undertaken the present research and come forward to publish this analytical book in an elegant way. War as a phenomenon is deep rooted in the history of man. Hunting and pastoral stages of human development are still remembered as martial activities. Even in ancient Indian mythology the conflict between Pandavas and Kauravas set during the period of early settlement of Aryans involved an element of state power in dispute and consequently there was a war around control of a state called "Hasthinapura". War has a definite meaning in contemporary civilisation. However, all human conflicts cannot be termed as war. War, simply refers to a fight between two sovereign nations and the causes for the initiation of a war may be many and varied. War is also one of the oldest human activities. Modern warfare may be referred to as the happenings in the last three decades. Physical, technological and social causes are responsible for the occurrence of wars. As such, the study of warfare requires an interdisciplinary approach. Thus there may be a need to look into modern warfare from physical, economic and social angles, their technological and scientific impacts, and the availability and proliferation of modern weapons and armed forces of a nation. War is an activity of human progress and destruction in the evaluation of civilisation. According to Quincy Wright, it existed even in the pre-historic, late Miocene or early Pliocene periods. The history of war can be arbitrarily divided into distinguishable periods with a frame of the differentiating advancement in science and technology. (1) Animal stage (2) Primitive stage (3) Historic stage (4) Modern Technological stage and (5) Contemporary Nuclear Space age. The first stage is associated in the psychological sense; the second stage in the sociological sense; the third stage, in a legal-political sense; fourth stage with industrial revolution, scientific and technological inventions and the fifth and present stage, with the advancements in aviation, nuclear space, science and technology. The causes of wars are many and no war in the past was waged without a due cause, since war is not a game with weapons. The causes of wars are broadly classified under four heads namely, political, economic, social and psychological. The aspirations of the nation states that form an international system with their national power and interest are the main reasons for the wars. Enmity arises between nation states especially when they share a common border or follow diametrically opposite ideologies. Every nation formulates her national objectives with reference to the national public opinion. There are many objectives for war. They are, to acquire new areas of land and water, to get back lost territory from the enemy, to take the wealth of the enemy country, to redeem the wealth carried away by the enemy during his previous success, to establish the prestige of a nation to gain independence or to create new colonies. Nations with their conflicting national interests try to dominate each other and these attempts lead to war. However the nation states resort to war and violence only after failing in all other modes towards the realization of their ambitions. Besides the conflicting national interest and the unscrupulous attitude of the statesmen, the versatile defects prevailing in the present international system also lead to wars. The inadequate system of international law, unstable equilibrium and the ambition of the nation states to reach parity with their mighty neighbours, economic inequality, political atrocities and hazards such as racial discrimination, state terrorism, colonialism and armed intervention, the feeble structure of the UNO, the incorrect demarcation of border lines at the times of war and attaining independence have been the sources of hatred, jealousy and wars. (i) contradictions in international relationship and their impacts. (ii) unstable and generally disturbed conditions that particularly prevail among nation states in their international transactions, relations and dealings. (iii) Inability to formulate a social institution (other than war) to resolve the difficulties arising between Nation-States from the political, economic and social institutions that they have built. It is already noted that war is a violent reaction between two organised political groups (governments or the like). Types of war may reflect the nature of the participants, nature of goals, the efforts they make to achieve those goals, and the resources they employ. Four types of war are seen as particularly relevant to world politics today. These four types of wars are total war, general war, limited war and revolutionary war. Total war is a struggle between governments in which at least one aims at the destruction of the other and uses all the means at its disposal to achieve that aim. Under present conditions total war between major powers would involve the use of thermo- nuclear weapons. General war is a struggle between governments in which at least one aims at the destruction or humiliation of others but does not use all the means at its disposal. Under present conditions general war between major powers could not involve extensive use of thermo nuclear weapons. For example World War II was a total war; if it occurs again it would only be a general war. Limited war is a struggle between major or minor powers in which each has a restricted goal and employs only a portion of its resources, usually within a defined geographical area Revolutionary war is the struggle between a non-governmental group and a government in which the latter attempts to destroy the former by using some or all the means at its command, and the non- governmental group attempts by all means or all its territory. For example during the Post-World War II period, the struggles that took place in Indo-China, Vietnam, Malaya and Algeria were revolutionary wars. The concept of revolutionary warfare refers to unconventional warfare and insurgency. In this, "insurgency" is the more general term of which "revolutionary" and "resistance" warfare are parts.' A revolution is a rapid, fundamental and violent domestic change in the dominant values and myths of society, in its political institutions, social structure, leadership, government activity and policies. Revolution has come to contain a vague assorted medley of meaning and is applied to developments of the most varied kinds. Historians, in consequence, have given us an almost endless number of different revolutions, such as, industrial, commercial, scientific and Protestant revolutions; intellectual, educational and military revolutions; and the urban, Neolithic, population, second industrial and racial revolutions. This loose and confusing use of the term merely illustrates how closely the idea of revolution has come to be equated with change. It would seem that all macro process of change whatever they are, must be described as revolution. Modern revolutionary warfare is the marriage of military force with political ideology; it is highly conditioned by local circumstances. Revolutions are most likely to occur when a prolonged period of objective economic and social development is followed by a short period of sharp reversal. The all-important effect on the minds of people in a particular society is to produce, during the former period, an expectation of continued ability to satisfy needs-which continue to rise-and, during the latter period, a mental state of anxiety and frustration sets in, when manifest reality breaks away from anticipated reality.